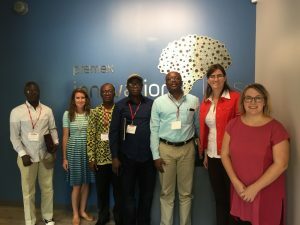 From September 12-25, 2017, Global Academy hosted a group of fellows from Ghana, two of whom hailed from the Ministry of Food and Agriculture and the other two from the private sector. The USDA-FAS sponsored Cochran program consisted of lectures, roundtable sessions, and practical field visits. The lectures were conducted by a number of faculty members from Prestage Department of Poultry Science and Department of Animal Science on topics such as industry trends and issues in poultry industry of Ghana, effective methods of feed formulation, government and state level inspection in broiler production and feed mills, and HACCP in feed formulation and manufacturing. 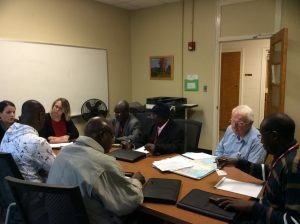 The group also met with North Carolina Department of Agriculture & Consumer Services’ International Trade Office to discuss shipping grain to Ghana and the trade logistics involved. 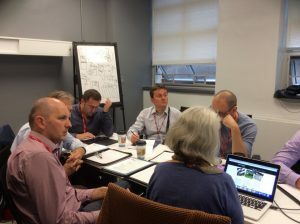 As grains are an important component of feed formulation, the group had roundtable discussions with North Carolina Small Grain Growers Association, National Corn Growers Association, and North Carolina Soybean Producers’ Association. 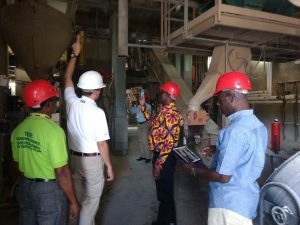 In important component of the training program included visits to private feed and poultry companies including Premex, Agrisupply, and Case Farms Calypso Feed Mill to observe their facilities and learn about feed milling practices. Eight fellows from Jordan participated in a training session on Food Supplement Programs from September 30-October 13, developed by CALS Global Academy. 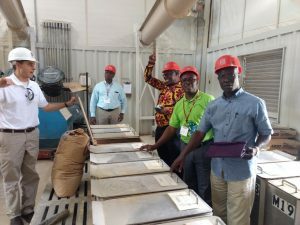 The group of fellows was accompanied by two officials from USDA and Department of State stationed in Jordan as well as two more USDA-FAS employees stationed in Washington DC. The training program consisted of lectures and roundtables as well as field visits, to allow for lively interaction and question/answer sessions among with fellows and the trainers. Multiple lecture and roundtable sessions were conducted by faculty from Department of Agricultural and Human Sciences, Department of Horticultural Science, Department of Crop and Soil Sciences. 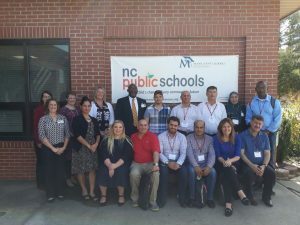 They also met with multiple state officials from North Carolina Department of Public Instruction, North Carolina Department of Agriculture and Consumer Sciences Food Distribution Division, North Carolina Division of Social Services to discuss a wide variety of government sponsored nutritional assistance programs. For a first hand look at how a school lunch program is carried out, the fellows had an interesting trip to Aberdeen Elementary School in Aberdeen, NC. 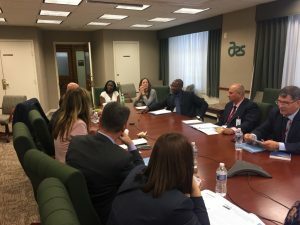 As this training program aimed at exploring role of the government in supporting food supplement programs, the group met with a number of USDA Food and Nutrition Service officials to discuss programs such as SNAP and WIC. Global Academy conducted a two week training on resilient agriculture for a group of six fellows from Bosnia from October 14 – 27, 2017. Their backgrounds included public and private sectors as well as university, which resulted in interesting and lively dialogues during the training sessions. The training consisted of roundtable sessions, workshops, demonstration sessions and field visits covering wide variety of topics pertaining to resilient agriculture. 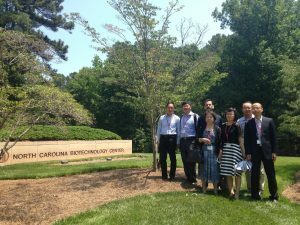 In addition to having round-table sessions with faculty from various CALS departments, they also toured a number of NCSU research facilities both in and outside of Raleigh. Some of these visits included USDA-ARS Climate Change/Air Quality Laboratory, Mountain Horticultural Crops Research and Extension Center, NC State Fish Barn, NC State Animal and Poultry Waste Management Center, Sandhills Research Station and Center for Environmental Farming Systems. Outside the university facilities, the fellows also met with concerned NC officials from USDA Farm Service Agency, USDA Rural Development Agency, USDA Natural Resources Conservation Service, and North Carolina Department of Agriculture and Consumer Services. Global Academy conducted a training program on Improved Adaption to Drought and Dry Cereal for four fellows from Mali and one fellow Burkina Faso spanning from November 4-17, 2017. While at NC State, the fellows attended lectures and roundtable sessions with faculty from Department of Agricultural and Human Sciences, Department of Crop and Soil Sciences, Department of Applied Ecology, and Prestage Department of Poultry Science. 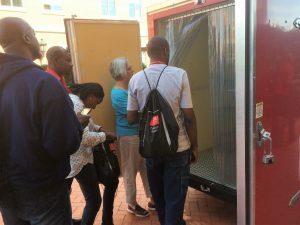 They also visited a number of NC State research facilities such as National Science Foundation Center for Integrated Pest Management at NC State, North Carolina Plant Disease and Insect Clinic at NC State, Center for Environmental Farming Systems, and Central Crops Research Station. To gain understanding of how the government is supporting environmentally friendly programs, the fellows also met with North Carolina officials from USDA Farm Service Agency, USDA Rural Development Agency, USDA Natural Resources Conservation Service, North Carolina Farm Bureau, USDA-ARS Climate Change/Air Quality Laboratory, and USDA-ARS Soybean and Nitrogen Fixation Research Unit. 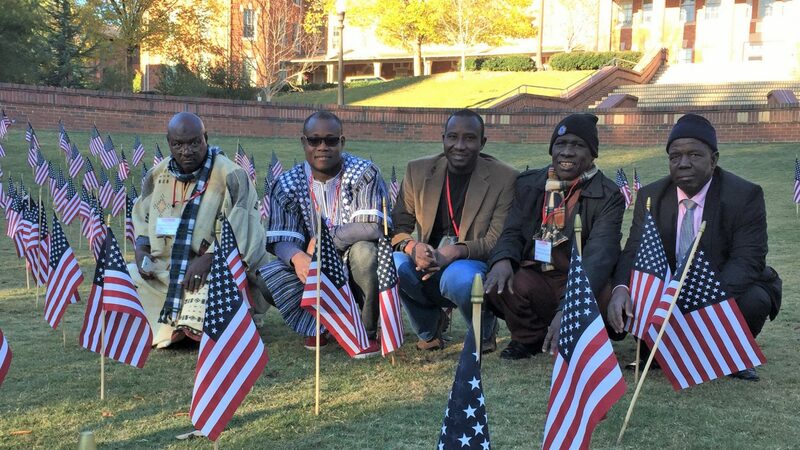 As most of these fellows worked in the cotton industry in Mali and Burkina Faso, they were interested in visiting similar industry facilities in NC. With that aim, they toured private businesses such as Rock Ridge Farms, Silver Lake Cotton Grower’s Gin, Cotton, Inc, and Pace Family Farms. 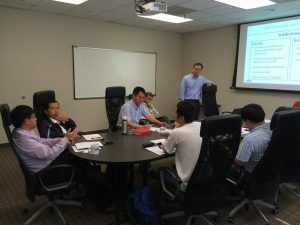 Through a USDA-FAS sponsored SCEP program, Global Academy hosted a group of fellows from China from Ministry of Agriculture (MoA) on the topic of plant variety protection and patents. During their time in the US, the group spent time in Washington, D.C., Raleigh, N.C., St. Louis, MO, and San Francisco, CA. In order to provide the fellows with a well-rounded, educational experience, CALS Global Academy provided opportunities to interact with government organizations, private companies, and university faculty members. The MOA members were able to meet with their US counterparts to discuss agriculture variety protection and patents through conversations with Janice Strachan from the USDA Plant Variety Protection Office and Elaine Wu and Shubo (Joe) Zhou from the US Patent and Trademark Office. These meetings were valuable in that it allowed for Chinese and US government representatives to exchange knowledge related to their own country’s practices. 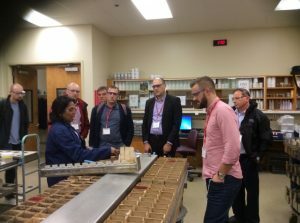 The group had the opportunity to visit with three of the primary plant genetics and seed companies in the US; Bayer CropScience (Raleigh, NC), Monsanto (St. Louis, MO), and Syngenta (Raleigh, NC). 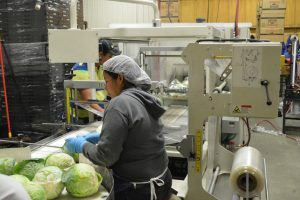 These companies offered the group a unique industry perspective on plant variety protection and provide them with specific examples and case studies. Additionally, the group attended lectures and case study examples in plant protection and patent law from two esteemed NCSU faculty members. 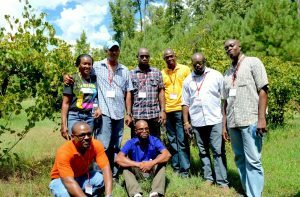 A group of seven marketing extension agents from the Jamaican Rural Agricultural Development Authority (RADA) attended a two-week training program on small farmer engagement through the promotion of community development from August 14 – 27, 2016. 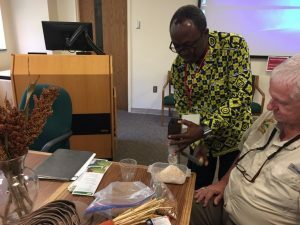 The program was coordinated by CALS Global Academy with assistance provided by Dr. Joy Morgan and Dr. Mark Kistler from the Department of Agricultural and Human Sciences. The program was designed to engage with the fellows through a combination of lectures, roundtable discussions, and practical field visits. The lecture and roudtable format allowed for the fellows to be presented with the overview of a topic, but then allowed for more in-depth question and answer session. This allowed the fellows to ask questions that are pertinent to their farmers and organization. 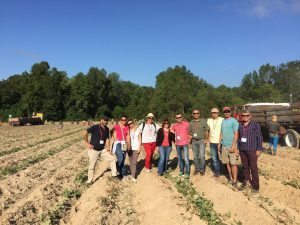 Additionally, the field visits allowed for the fellows to see a diversity of postharvest management, agritourism farms, and extensions programs. 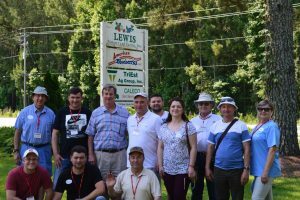 A group of seven Moldovans coming from a variety of different agricultural backgrounds and professions participated in a two-week training program in the area of postharvest from June 4-17, 2016. The program was coordinated by CALS Global Academy in conjunction with two retired NC State faculty consultants with expertise in this area. CALS Global Academy provided the logistical coordination support while the training consultants developed the training agenda. The program was carefully designed to impart knowledge of postharvest through a combination of lectures and practical field visits. The benefit that the field visits offered is that the group was able to observe and engage with industry experts and their NC farmer counterparts. 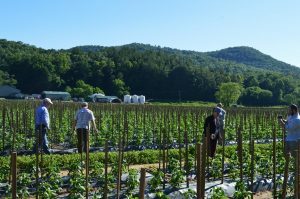 The program coordinated visits that allowed the group to visit farms and facilities from the coast all the way to the mountains of North Carolina. 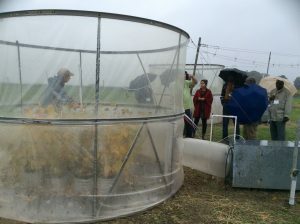 This allowed the group to see a diversity of farming environments and items produced. Through their journey across the state, the group also had the opportunity to visit with different agricultural producers, such as Dole Foods in Kannapolis. 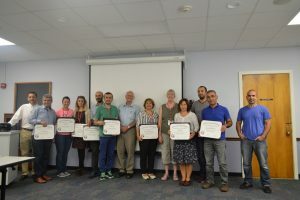 A group of seven agriculturist from Turkey participate in a two-week training program in the area of agricultural biotechnology, developed by CALS Global Academy in conjunction with NC State’s Genetic Engineering and Society Center (GES). 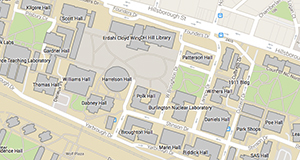 The involvement of GES, co-chaired by Dr. Fred Gould and Dr. Jennifer Kuzma, allowed us to involve lecturers with a diverse background who are experts in communicating about biotechnology. 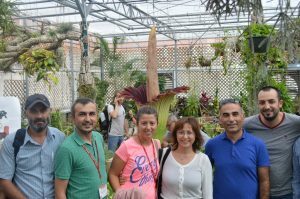 In order to provide the fellows with a multitude of perspectives on agricultural biotechnology, the use of lectures, industry visits, and field experiences were carefully balanced. The program consisted of a diverse group of lecturers spanning eleven departments representing three different colleges. This assorted group of esteemed faculty lecturers allowed the fellows to learn about the scientific, economical, and political aspects of biotechnology as well as learned effective strategies to communicate with the public and private sectors on issues related to agricultural biotechnology. 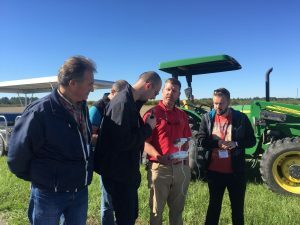 The benefit that the industry and field visits offered is that the group was able to observe and engage with industry experts and their NC farming counterparts. Industry visits to Syngenta, BASF, and the NC Biotechnology Center allowed the fellows to learn about the effort required to create their products as well as their environmental and economic impact. The fellows also visited two family farms who have incorporated biotechnology crops. These visits allowed the group to get a farmer perspective of the impact that the implementation of these crops had on their day-to-day operations. The fellows were also able to ask questions related to pesticide use and using GMO crops in rotation with non-GMO crops. 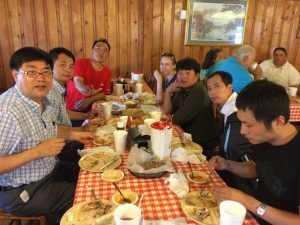 In 2015, Global Academy conducted a training program on Swine Genetics and Production for five fellows from China spanning from May 31 – June 13. During the fellows 2 week visit to the United States, the group was able to engage in a variety of activities related to US swine practices. In order to give them a broad educational experience, the fellows traveled to the two largest swine producing states; Iowa and North Carolina. 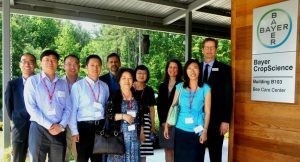 While in North Carolina, the group underwent educational seminars provided by North Carolina State University, toured swine genetic companies, and visited swine research farms. In Iowa, they attended the World Pork Exposition which is an event that attracts several international vendors and swine breeding companies. While in Iowa, the group was able to tour and speak with vendors, attend seminars, watch pig shows, and engage with a large variety of swine genetic providers. Over the course of the two week training, the group attended educational seminars provided by university professors and industry leaders. These educational seminars consisted of talks and discussions about swine genetics, problems currently facing the swine industry, and swine nutrition. 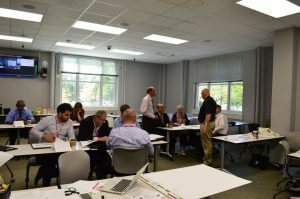 In addition to the two seminars and group discussion presented by N.C. State professors, the group was able to hear from several professors from different U.S. universities at the World Pork Expo. One seminar of particular interested was presented by Dr. Safranski from the University of Missouri which covered seasonality and the impact it is has on reproductive efficiency. Six fellows from Pakistan came to the United States to be trained in dairy genetics and management from September 26 – October 10, 2015. The fellows were able to engage in a variety of activities related to US dairy practices. In order to give them a broad educational experience, the fellows traveled to the two important dairy producing states; Wisconsin and North Carolina. 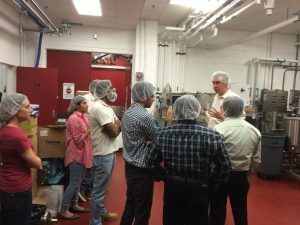 While in North Carolina, the group underwent educational seminars provided by North Carolina State University, toured dairy companies, and visited dairy research farms and dairy processing plants. In Wisconsin, they attended the World Dairy Exposition which is an event that attracts several international vendors and dairy genetics and equipment for dairy processing companies. While in the World Dairy Expo, the group was able to tour and speak with vendors, attend seminars, and engage with a large variety of dairy genetic providers. 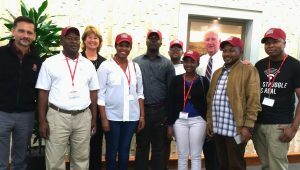 Five fellows from South Africa and two from Kenya came to the United States to be trained in Agricultural Policy for three weeks. The fellows engaged in a variety of activities related to US agricultural policy. 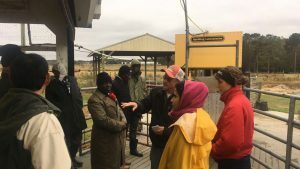 In order to give them a broad educational experience, the group underwent educational seminars provided by North Carolina State University, toured farms, visited research farms, processing plants, met government officials, among others. 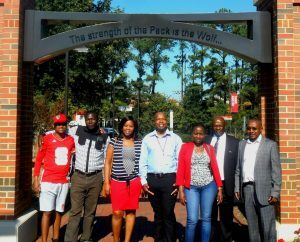 At NC State, the group had discussions with faculty members from Department of Agricultural and Resource Economics and Department of Agricultural and Extension Education. The lectures focused specifically on various aspects of international trade policies, agricultural extension policies, and domestic and international organic policies. The group met with officials from North Carolina Farm Bureau, NC Sweet Potato Commission, North Carolina Department of Agriculture & Consumer Services. In order to learn more about how associations help shape agricultural policy, the group attended Carolina Meat Conference in Winston-Salem, NC. Finally, the group also had the chance to tour Farm Pak Products Inc, a private company located in Spring Hope, NC.